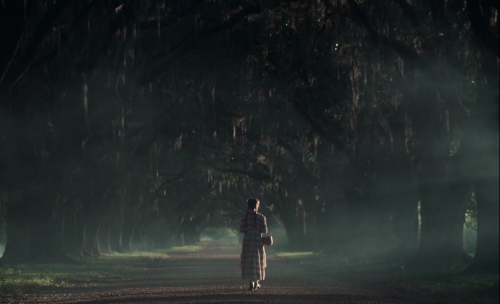 Sofia Coppola’s re-imagining of the Southern gothic potboiler novel by Thomas Cullinan (previously brought to screen in 1971 by Don Siegal and Clint Eastwood) is a lean, mean, beautiful thing streamlined through white lace and steamy moss-strewn environs with seductive Louisiana plantation swamps draped in lush symbolism standing-in for war-torn Virginia. Every single meticulously composed shot…from Amy, both resting and sentinel, on the hulking branch of a giant moss-covered live oak…to ennui-suffering teenager Alicia (Elle Fanning) leaning back in her chair in the streaky sunlight while the younger girls play in the tall grass…to a candlelit dinner darkly roasted with insidious intentions…is like a moving painting. There’s not a single shot directed by Coppola and executed by Philippe Le Sourd wasted here, all ripe with symbolism or moving the plot along. Likewise, sparse to-the-point dialogue (the entire language of the film mirroring the bluntness of Martha’s speaking and pitting it against the flowery antagonism of Corporal McBurney’s invitations) moves everything forward. Music, be it wonderful renditions of the olde-timey standard “Lorna” or the suspenseful ambience of Phoenix’s barely-there musical score, is exactly where it should be and precisely where it’s not. Meanwhile, the young ladies (along with their teacher Edwina…played with subversive submissiveness by a stooping-shouldered Kirsten Dunst, lost in her own dreams of another more exciting life elsewhere) are all given unique personalities, each one defined by their learned specialty (a musical instrument, a singing voice) or self-cultivated pleasure (like Amy’s curiosity and love for nature)…yet weighed down by societal and sexual mores, none living to their full potential. In his own emotionally manipulative ways, the Corporal uniquely promises each of them some kind of escape from their protective, hum-drum existence. But thank the Good Lord, Miss Martha is there to provide them the strength they need to survive these times…these troubling, troubling, dark, dark times. When that pot finally boils – and wow, does it boil with a cacophonous sound-design that shocks you into being right there amidst the yelling and plate smashing and chandelier crashing! – Martha, aided by the wit and imagination of one of the young ladies, knows exactly what to do to rid them of this dangerous individual. Meanwhile, on the modern-day French-Swiss border in Frederick Mermoud’s adaptation of the Tatiana De Rosnay novel, Moka, Diane (a quietly raging, epically grieving Emmanuelle Devos) is searching for her own kind of strength to enact her revenge on the couple who killed her son, Luc, in a hit-and-run. Against the backdrop of beautifully looming mountains, a deep glacial lake, and an international border (every time she crosses the lake to the other side in pursuit of those responsible for her son’s death, it’s like she’s emotionally going into another world), Diane’s journey is made rich and unforgettable. As in the Coppola film, the aesthetics and atmosphere of the place are symbolic of the emotional turmoil of the woman at the center of the drama. Likewise, the music (a subtle blending of moody minimalist original pieces and Beethoven’s “Moonlight Sonata”) is a pointed off-shoot of the psychological space in which the characters live. Diane eventually tracks down the owners of the suspected vehicle involved in the accident (a mocha colored classic Mercedes coup), a salon/spa owner (Nathalie Baye, done up to look like a working-class French version of Helen Mirren) whom she awkwardly befriends while trying to uncover the truth of the situation, and her fitness instructor partner (David Clavel) who’s conveniently trying to sell the car which Diane is now trying to purchase. Of course, this is a melodrama mirroring the complexities of real-life, and there are no easy answers or explanations. But Diane, in uncovering the shocking truth, realizes that her grief cannot be vanquished by revenge, and can only be understood through connections with other people. The film thoughtfully closes not with the aftermath of the suspenseful climax, but with the emotional aftermath of Diane’s internal revelation. Throughout the film she has been carrying Luc’s screen-cracked cell phone, peering into that secret life children that age begin to develop as they go to school and make friends and take up extracurricular activities through his pictures and videos, and avoiding the repeated phone calls from a young girl, Adrienne, who just wants to hear her friend’s voice on his voice-mail message because she misses him so much. This young girl, like the young girls in The Beguiled, needs some strength to survive in these times. Diane, finally having found some strength of her own, is just the grown woman to pass that strength on to her. Together, they watch a video of Luc playing the violin that Adrienne had recorded before the accident, the boy’s stoic determinism in playing the piece broken up intermittently by a look, a smile, healing both of them. Both films, while tangled emotional webs, are crafted with careful precision and paced to the point, each film breathlessly around the 90 minute mark. The women and young ladies of The Beguiled, while saved for the time-being through their own volition, are still trapped in their picture-perfect but oppressive setting – gifted with strength but not freedom, temporary victors but victims still of time and place and circumstance. In Moka, the modern women and girls have not only found ways to conjure their own strength, but are free to cross that lake of grief and loss over and over in search of each other so that they may pass that strength on. Perhaps there is such a thing as progress after all. This entry was posted in Art-house Cinema, Book to Film Adaptations, Movie Reviews, Movies, Psychology and tagged Beethoven, Colin Farrell, David Clavel, Desire, Elle Fanning, Emmanuelle Devos, Emotional Turmoil, Foreign Films, France, Frederick Mermoud, French Films, Grief, Kirsten Dunst, Longing, Lorna, Loss of a Child, Louisiana, Manipulation, Melodrama, Melodramas, Moka, Mood Piece, Moonlight Sonata, Nathalie Baye, Nicole Kidman, Oona Laurence, Philippe Le Sourd, Phoenix, Potboiler, Psychological Thrillers, Sofia Coppola, Southern Gothic, Switzerland, Tatiana De Rosnay, The Beguiled, The Civil War, Thomas Cullinan. ← How Does a Man Become a Cow in The Salesman and My Cousin Rachel?